Ifor’s last Listener was nearly two years ago with Prometheus Bound and Unbound. Before that we had Pirandello, the Dam Busters and Flying Scotsman. This week, a bit of musical trigonometry? There was an interesting clueing device this week — not one, but two extra letters to be removed from the clues that didn’t lead to 4-letter entries. Choosing one letter from these pairs would give us a harmony and its creator. The first thing I noticed when reading the preamble was the use of slightly odd wording: ‘abandons’, ‘cast out’ and, the reference to thematic items, ‘one a luxury’. Only that week, I had come across an article with a picture of Kirsty Young regarding the upcoming 75th anniversary of Desert Island Discs. Well that confirmed the musical element of the title; the trigonometry would have to wait. 2ac related to a 4-letter entry and needed something removing from its 8-letter answer. However, the clue had me foxed Dash in to test numbers of inferior figures that have little in common (8) (indeed, it would confuse me right up to the end). Luckily, 5 Furious debating about right to display artificial skin (7) wasn’t thematic so just needed two letters to be removed and it looked like ‘debating’ would become ‘dating’ or eating’. INTEGRA® meant that it became ‘eating’. I tried the down clues and managed 1 Bands bustled across, leaving Dover and embracing France (6) SCARFS (dropping L and D in the clue) followed by 2 Tease troops caught among wrong squaddies (9) leading to TORMENTOR. I nearly thought this was wrong since I couldn’t see what 5-letter word could be dropped, but I checked Chambers and was rewarded with seeing that MENTO was a form of Jamaican song or ballad. 4dn looked like it should be SCOPAS, but C told me the plural of scopa was scopae. Luckily, my eye wandered and I saw that scop just above had a plural of scopas. 6dn NATURE, 9 RAGOUT and 10 ABULIA meant that the top of the grid was coming along nicely. Sadly, this early flurry of activity slowed to a bit of a crawl and clues needed a lot more work to unravel. This wasn’t helped by some of the bizarre words that were left after the two letters were removed from clues. For example, 3dn False reaction with little credit devolved (9) became False rection with little credit evolved (9) and 21dn Do Spanish walk cliff, upset with ape? (6) had ‘cliff’ becoming ‘iff’ (a word in logic meaning ‘if and only if’). Clue of the week for me was 29ac Word of agreement binding spotty curate’s clerk in Canterbury (7) which became Word of agreement binding potty curat’s clerk in Canterbury (7) leading to ACTUARY. And best new word of the week: ARCHONTATE, an ancient Athenian magistrate’s tenure of office. In the end, the grid took the best part of three hours to fill. When it was about 75% complete, I checked the letters dropped from clues, and wasn’t surprised to see that they were just a few short of Desert Island Discs and By the Sleepy Lagoon, the theme music. These were followed by Roy Plomley, the creator of the show, and Eric Coates the composer of the music. Its 75th anniversary meant that the show came to life in the midst of World War II — 1942. The 4-letter entries were all derived from clues to longer words that lost something thematic. In clue order, these were: FORE(LAY), AIRT(RAP), T(RAG)ULE, (CATCH)ABLE, FIL(ARIA)L, S(PORT, a bagpipe composition)ING, TOR(MENTO)R, D(OAT)ING. That gave the eight pieces of music that we, as guests, could take to our desert island, and a bizarre concoction it was. Guests are also allowed to take the Complete Works of Shakespeare, a Bible plus a third book and a luxury item. The first was provided by 12ac SCAB(BARD). Now, where was the Bible hiding. That was there, ‘in two abbreviated parts’, provided by the Old and New Testaments in 1ac T(OT)IE(NT)S. I needed to refer to Wolfram to understand this and hoped that this month’s mathematical setter hadn’t been beefing up on them! Time to find the luxury and something ‘more relevant to solvers’, which would be the third book. We were guided to these by the clue that had two definitions to words differing by one letter: 24ac One who supports boxer, maybe (6). This led to BACKER and PACKER which in turn gave us CHAMBERS and CHAMPERS in the NW–SE diagonal. 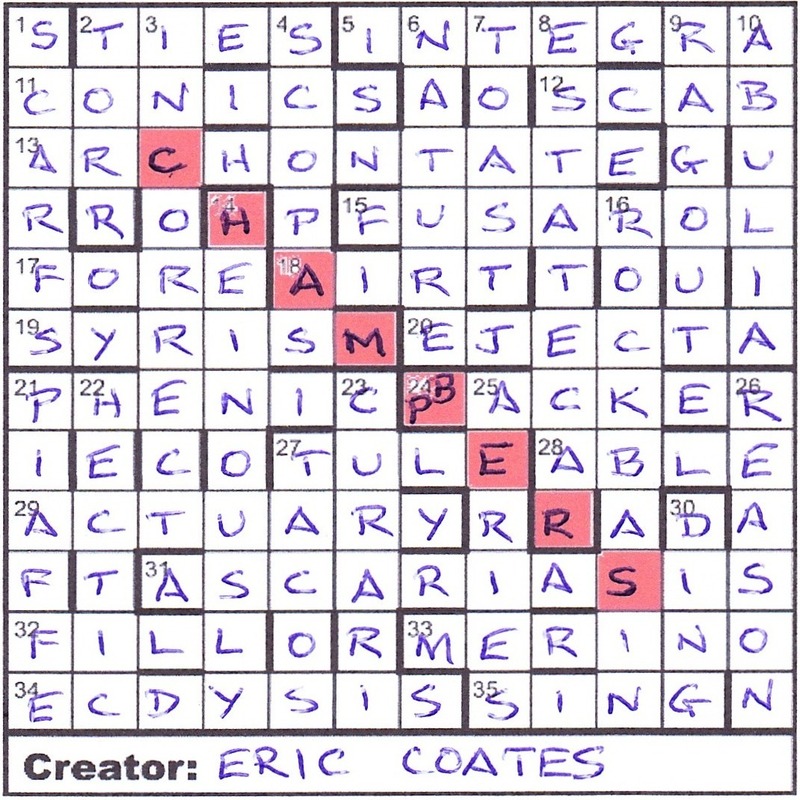 The creator who had to go under the grid was the creator of the harmony, namely ERIC COATES, rather than the creator of the programme itself (I hope). As for the title, I assumed that it was referring to the symmetry of both titles having the same number of letters as did both creators. I wasn’t too sure of this, and a bit more investigation revealed that ECCE RATIOS was an anagram of the composer. Very satisfying! Thanks, Ifor. A superb implementation of the Desert Island theme and great fun. This entry was posted on 17 February 2017 at 4:00 pm	and is filed under Solving Blogs. Tagged: Harmony of Ratios, Ifor. You can follow any responses to this entry through the RSS 2.0 feed. You can leave a response, or trackback from your own site.